The recent financial crisis has had a devastating impact worldwide. Thousands of businesses have closed, millions of jobs have evaporated and many people have lost their homes. Studies and reviews abound, but this book is different in its construction, style and proposal. Published as ‘Capital and the Debt Trap’ by Palgrave Macmillan in 2011, the book explains how we have fallen into a trap linking the financial sector to the real economy, not only with a rigorous and in-depth analysis, but also theoretically, exploring the fundamental issue of control. Unknown to many, cooperatives around the world have been relatively resilient to the crisis. How has this been possible? In the second part, through four case studies, the book explores the strategies of cooperatives to deal with the crisis and their type of control, framed in a broader debate about wealth creation and sustainable development. The cases are: Natividad in Mexico, Ceralep in France, Desjardins in Canada and in Mondragon in Spain. To the general public seeking to understand the crisis, and all those engaged in the study of political economy, corporate governance, development studies and cooperatives, we invite all to discover new theoretical approaches and recent field research that contains the book. In these excerpts from the Preface, Professor Ian MacPherson, world-known scholar on cooperatives, described the book as follows: “Cooperatives … are typically undervalued in the development of public policy, though governments in different times, places, and situations have often found them useful. In contrast to this rather dismal and frustrating situation, this book presents a thoughtful and exciting consideration of the roles co-operatives can play – and should be expected to play – today. From among the many important dimensions that characterize this book, five are arguably of particular important. The first is the context within which it is cast. It begins with a discussion of some of the current major issues confronting the world today and not with an “internalist” discussion about co-operatives. It provides a strong and stimulating discussion of the financial breakdown of recent months. It examines what the authors consider are the key economic “traps” of our times – in consumption practice, liquidity capacities, and debt accumulation. This discussion then becomes the context within which the co-operative model and options are then considered. The book is based on a well informed and carefully argued examination of the current global situation; an examination that in turn makes what they have to say about co-operatives particularly acute and useful. The second most obviously important feature of the book is the way in which the authors take seriously the underlying values and principles … Ultimately; they are what makes the co-operative model particularly relevant in the modern era. Thirdly, the book provides a stimulating discussion of the importance of control over the economy. This consideration leads invariably to the importance of “control” within co-operatives. It is a challenge that co-operators and co-operative organisations need to address constantly and more deeply. Fourthly, the book provides case studies of quite different types of co-operative organisations in four widely divergent circumstances in Mexico, France, Spain, and Québec. These cases demonstrate the variety of co-operative enterprise. They show differences in approaches, the importance of cultural and local circumstances, and the versatility of co-operative entrepreneurship. Finally, the book is particularly interesting because it addresses the “big picture.” This is a refreshing, relatively uncommon, exception in the intensive literature of the co-operative movement. This book is an imaginative and thoughtfully constructed exception. It dares to postulate the possible centrality of co-operative enterprise today and in the future. It joins with some other recent scholarship exploring in a rigorous and tough-minded way what the current situation is and to suggest why and how the co-operative model is so important. It deserves to be widely read and discussed within and across the boundaries that have long divided co-operative proponents and the general public. It is an important opening statement, hopefully the first of many that will deepen celebrations of the United Nations Year of Co-operatives in 2012. It raises many of the issues that need to be discussed more fully; it provides a particularly useful framework within which those discussions can take place. Amazing site! Thanks for creating it. Keep posting that way. Thanks for another informative blog. Where else may just I am getting that type of information written in such an ideal means? I’ve a venture that I am simply now running on, and I have been at the look out for such info. Thanks for any other wonderful article. The place else could anyone get that kind of information in such a perfect approach of writing? I have a presentation next week, and I’m on the search for such info. In which way would it help? all the best with the coop! How are you doing? 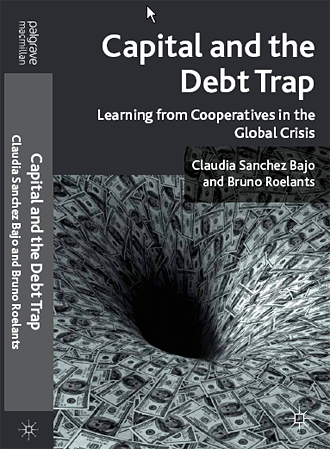 "Capital and the Debt Trap combines a searing critique of the unstable debt- and-profit driven system that came close to final collapse in the Great Crisis with a fine portrait of the modern cooperative alternative that exists today in Mexico, Canada, France and Spain. Are these perhaps the small creatures that will survive and flourish after the great dinosaurs are gone? Let’s hope so." Capital and the Debt Trap | Powered by WordPress.